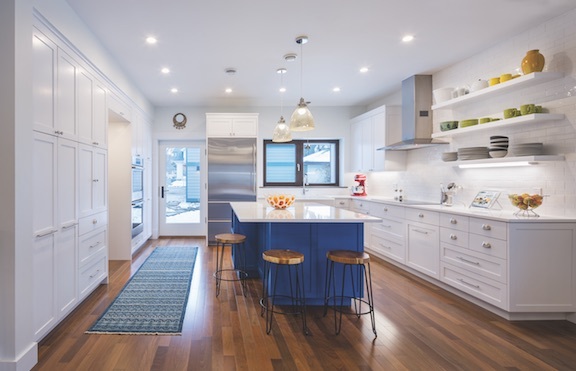 When the location is perfect but the home has outgrown its usefulness, custom builders can step in with the ideal solution: a new home that addresses all of the client’s needs and is energy efficient to boot. But infill construction is complicated. It involves permitting, zoning, demolition, and sometimes, historical preservation challenges, along with a strong dose of diplomacy when dealing with planning/zoning officials and neighbors. Design review guidelines can be stringent, covering everything from lot coverage and floor-area ratios to exterior materials and garage placement. Planning officials, board members, and neighbors all get their say. The process may differ from jurisdiction to jurisdiction and even from project to project, but in many cases the architect shepherds the project through this phase. 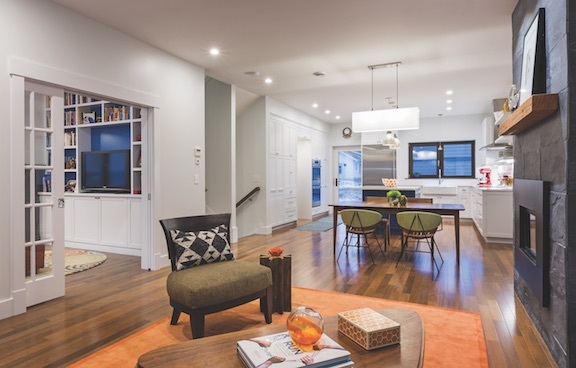 “We have spent significant time over the years developing relationships with local planning and zoning officials and neighborhood organizations,” says architect Tim Eian, principal of TE Studio, in Minneapolis, which specializes in passive house design. “We’ve actually provoked quite a bit of change to the [permitting and approval] process and raised awareness [of] the [passive house] approach in Minneapolis.” For example, it’s now permissible to add insulation beyond the building setback. “Making a ‘fat,’ well-insulated wall is no longer looked at as building an addition,” Eian says. Other changes include updates to the development point system in Minneapolis, which establishes rules for such items as minimum fenestration for buildings. While the point-system requirements sometimes used to contradict the placement and sizing of windows in passive house design, “Now we’re able to reconcile this with the city,” Eian says. Builder Ryan Stegora of RJ Stegora Inc., in Apple Valley, Minn., says the design guidelines in Minneapolis aren’t biased toward certain styles. “The guidelines are strictly based on types of siding and roofing materials, and garage placement,” he says. However, south of San Francisco in the city of Burlingame, Calif., new homes must undergo a design review process and two public hearings. Randy Grange, principal of architecture for TRG Architecture + Interior Design, in San Mateo, Calif., says it can take eight months or more to complete this process. The clients were staunchly committed to their neighborhood, a part of Minneapolis known as Northeast. “They like being close to stores, parks, and biking trails, and it’s convenient for work,” says interior designer Christine Frisk, owner of InUnison Design, in Minneapolis. But with three children, the couple needed more space and light than their 1912 home offered. They also wanted to reduce their energy consumption. A remodel was considered, but structural shortcomings made it almost as expensive as building a new house. Consequently, when the lot next door went up for sale, the clients purchased it and demolished the existing home on the property. Once architect Tim Eian, principal at TE Studio, in Minneapolis, explained the advantages of passive house design, his clients were sold. TE Studio’s floor plan was heavily modeled on the clients’ existing home next door, and then coupled with improvements to make the new home, Nordeast Nest, more efficient and a better fit. Frisk created an eclectic interior look that pairs modern angles and bold colors. 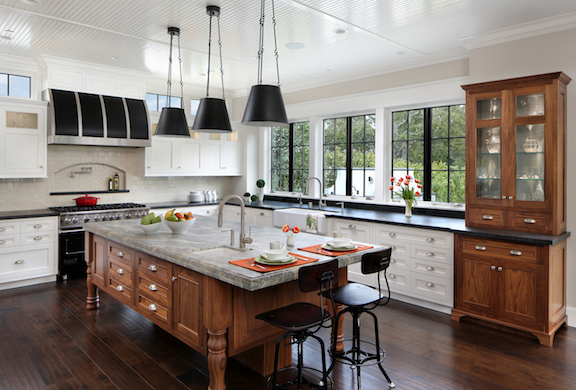 The kitchen island, for example, has a blue base while the cabinet doors have more of a Shaker style and rail. At 2,700 square feet, the home isn’t overly large for the site but still offers a family-friendly layout. The two boys share a bedroom, and all three children share a bath. 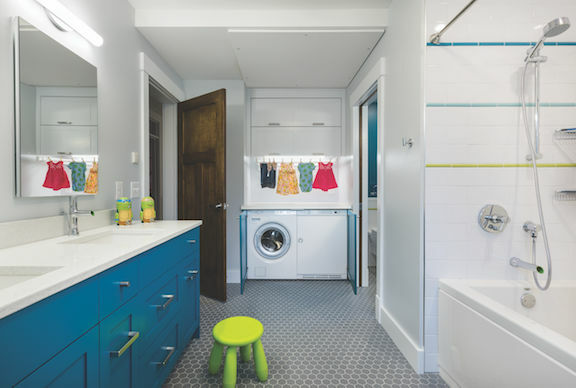 A laundry room was incorporated into the kids’ bath. There is a full basement with a guest room and a three-quarter bath. 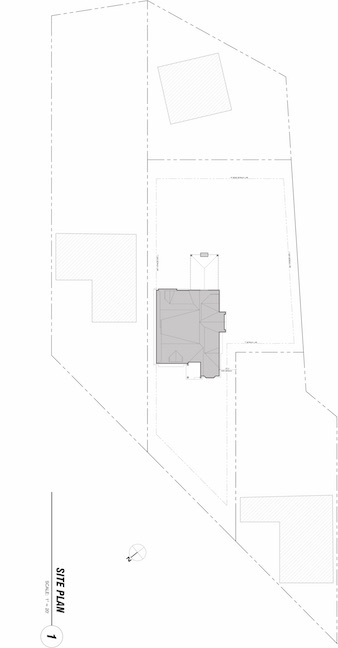 The area between the house and the detached garage is private outdoor space. While Nordeast Nest is not a certified Passive House, it does meet the requirements for the Passive House Institute (PHI) Low Energy Building Standard, with triple-pane German-made window, well-sealed and insulated doors, and 17,000 pounds of dense-pack cellulose in the walls, contained in a 12-inch “pocket” surrounding the entire house. All this is supplemented by 2 feet of loose-fill insulation in the roof. 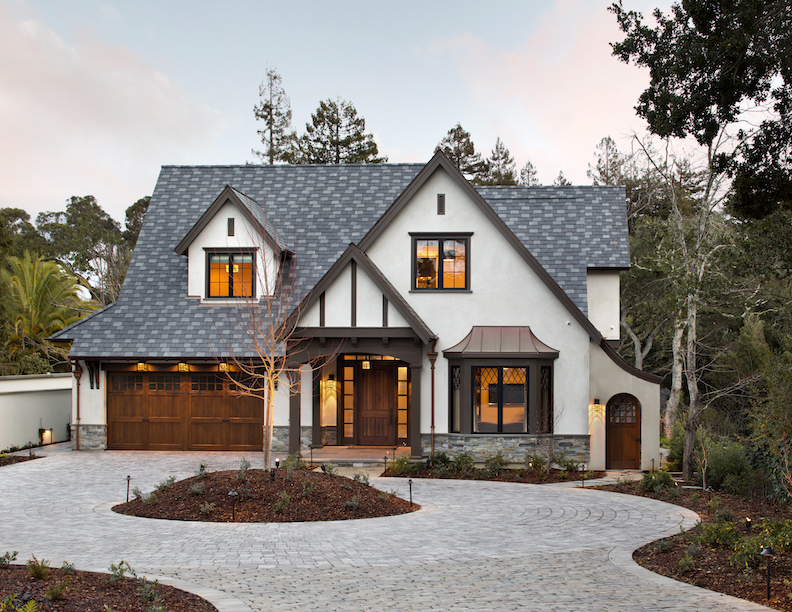 A couple with two college-age sons approached TRG Architecture + Interior Design after purchasing an infill site in Burlingame, Calif., knowing that the existing Tudor-style home couldn’t be renovated to meet their needs. TRG principal Randy Grange recognized that the design review process would be smoother if the new home fit like a glove: also Tudor style, with a similar placement on the site as the old one. “There’s a big quest for neighborhood context in Burlingame,” he says. The clients lucked out, Grange says, in acquiring a larger-than-usual property in a neighborhood where lots are typically 50 by 120 feet. The site is irregularly shaped: 57 feet wide in front, 114 feet at the rear, and 232 feet deep on the far left side. “They got a little more land, and it backs up to a creek, giving it a woodsy feeling,” he says. A deep setback in the front allowed enough room for a circular driveway, so the clients and their visitors don’t have to back their cars out into the street. The house itself is 5,080 square feet, plus the garage. Because it’s parallel to the side-yard property line on the left, TRG stacked the garage, mudroom, and kitchen on that side, and were able to include a spacious, hardworking pantry. 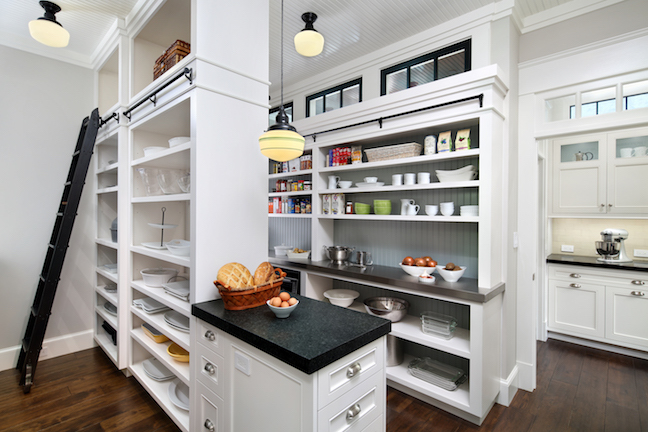 (The client wanted a pantry the size of a two-car garage. “We got him to come down on that, but it’s still the biggest pantry we’ve ever done,” Grange says.) Set at the rear of the home, the kitchen opens to a large living and dining area, overlooking a spacious back yard with a covered patio and outdoor cooking space. The other two sides of the home open to the backyard. Lush vegetation screens private areas from the neighbors’ view. Major effort was made to draw light into the house: a large skylight over the centrally located stairwell; interior transoms; and pocket doors with glass inserts in the family room. An office near the front door is large enough for a conference table and also serves as a library, guest room, and media room. Contrary to received wisdom, a thorough understanding of the permitting and approval process in your local jurisdiction will go a lot further than calling in favors, says Kevin Casey, CEO of New Avenue, in Berkeley, Calif. Casey, a developer, designer, and builder, founded New Avenue to bring clients together with vetted architects and contractors for remodels or new builds, and to provide financial administration for each project. It’s common for the architect to submit and track permit applications and attend public hearings. San Antonio, Texas, architect Craig McMahon rarely hands off drawings to the contractor for permit application because too much specific information is required. “There are four or five separate cities within the geographic area of San Antonio, and each has nuances that require special attention,” McMahon says. New Dimensions, a custom builder in Manassas, Va., builds 40 to 50 homes per year, of which 95 percent are infill. Company president Jennifer Landers says, “The client applies for the building permits, as they are the lot owner. We’ll help them through it if needed, but most hire a permit runner.” Permit runners, or expediters, are hired to start the process and keep it moving, while keeping the project team on top of any new information that’s required. Landers says that in her market area, a permit runner costs $1,500 to $1,800.McMahon meets with the project architect before drawings are completed, helping to ensure that specific zoning requirements are satisfied. This makes for a smoother permitting process. “We often use 3-D images to show that a new design works better than if we followed the guidelines verbatim,” he says, adding, “It helps that the cities know we are from [this area] and live here and that we, too, are concerned about the neighborhood and the end result.”It may take weeks or months to secure a permit, depending on whether or not a variance is being requested. Comments on: "Diplomacy Goes A Long Way With Infill"